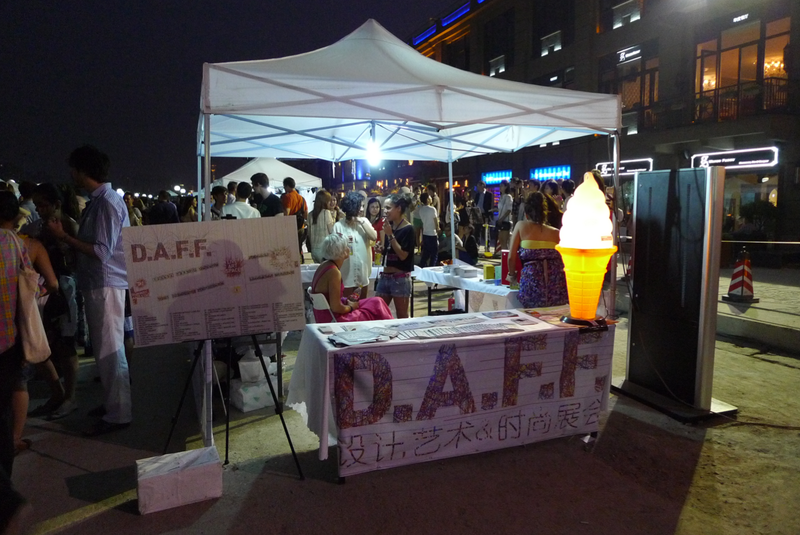 The time has come to report about ProonK at DAFF, the Design, Art & Fashion Fair in Shanghai that took place at Wharf 1846, Bund Promenade on Cinqo de Mayo last Saturday. After a couple of VERY busy weeks in the studio, trying to get as much jewellery done as possible (23 Globalorettes, 23 pairs of earrings, 24 Solitaire Rings, 8 Clover Rings, 5 Cluster Rings, 24 ProonK Rings, 4 MeiHua Book Marks and 3 pairs of Solitaire Cufflinks), I was ready to embrace this event. Luckily with the help of two really great people, Rachel Marsden and Barry Sinnott who went far and beyond to help with packing, coordinating, planing, setting-up, chatting, attracting, looking great in their ProonK T-Shirts, feeding me, take-down, schlepping and of course partying… Thank you so much! 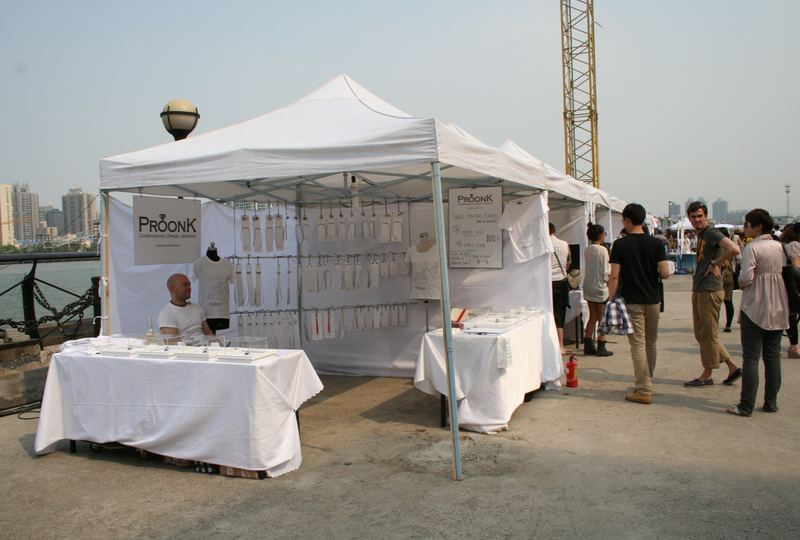 I was very nervous at first, since this was the first time I participated in such an event with ProonK but it was super exciting at the same time, not really knowing what to expect. The Ice Cream Truck-team, the main organizers behind the event, kicked it off with a pre-party at Source, which was a great opportunity to meet other artists and designers participating in the fair. I met Frau Ana, a German fashion designer based in Shanghai for the first time, as well as the product designer Jonas Merian from Jonas Design and my friends Nini and Gregor from Idle Beats. 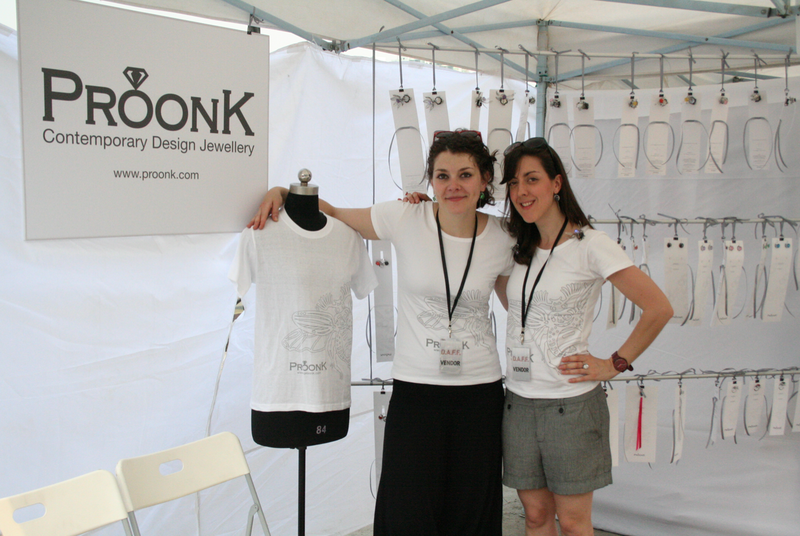 I met the two because of a screen printing workshop in which I participated last Thursday to print my own ProonK T-Shirts. They looked absolutely fabulous and it was such a lot of fun to print them with Gregor, who is a taught Church-Painter (Kirchenmaler), a trade that I wasn’t even aware existed but sounds incredibly exciting! 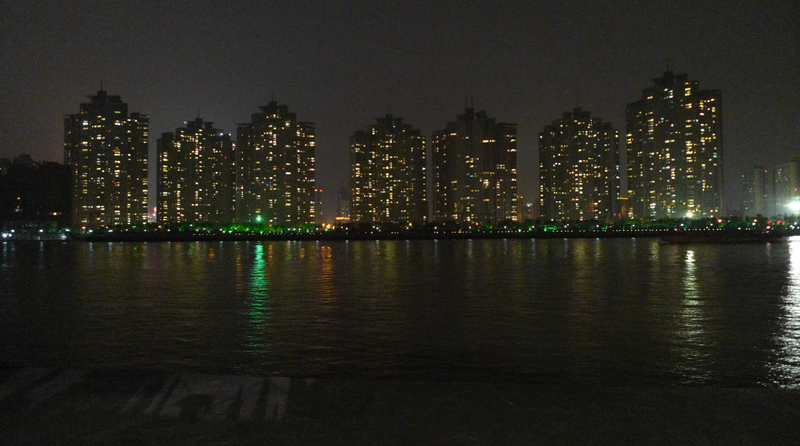 I will blog about the print-making evening in a separate post soon. The party was big fun, partially because of the free beer and pizza, which were the reason why I had BIG trouble rolling out of bed in the morning at 8am. Somehow we made it to the Wharf around 11am and we managed to set everything up in time. I decided to go with a hanging theme, since it was easy to transport and install and did not look super heavy. I am not a big fan of displays that kill the excitement of entering right on the doorstep. 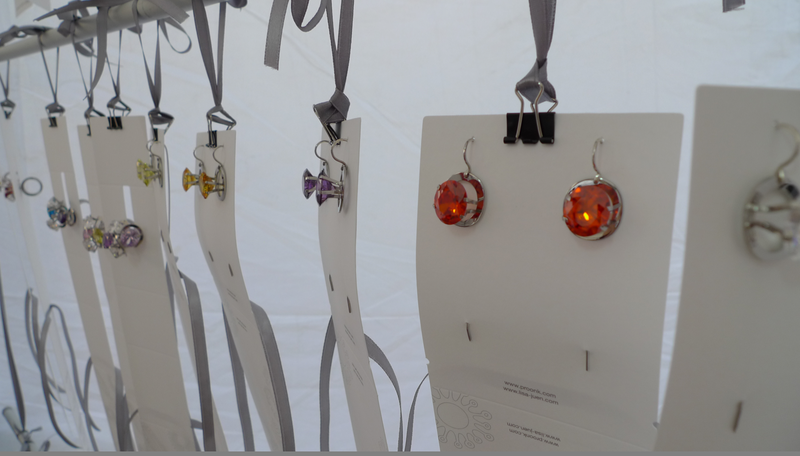 The hanging idea was perfect, since I attached the jewellery to its packaging and it was very easy to wrap them up and send them on their way. DAFF officially started at 2pm and was meant to run until 12pm. 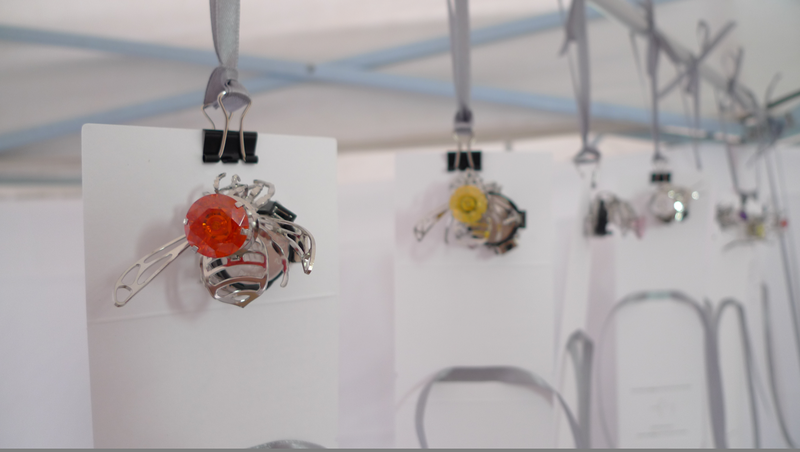 There were several artist and designers participating, as well as food and liquor stands. I had some great sausage from Amelia, the lady in Shanghai who is known for her jam. Recently, she started to sell home-made sausages too, which were a DELIGHT! I had to go back a second time to satisfy my meat-cravings! Around 4pm, there was a fashion catwalk with Frau Ana and other participating fashion designers. Unfortunately, I could not see it, since a lot of visitors started to show up around that time and we were all super busy talking and introducing ProonK. I think the majority of people visiting really liked what we had to offer and it made me really happy to see that. 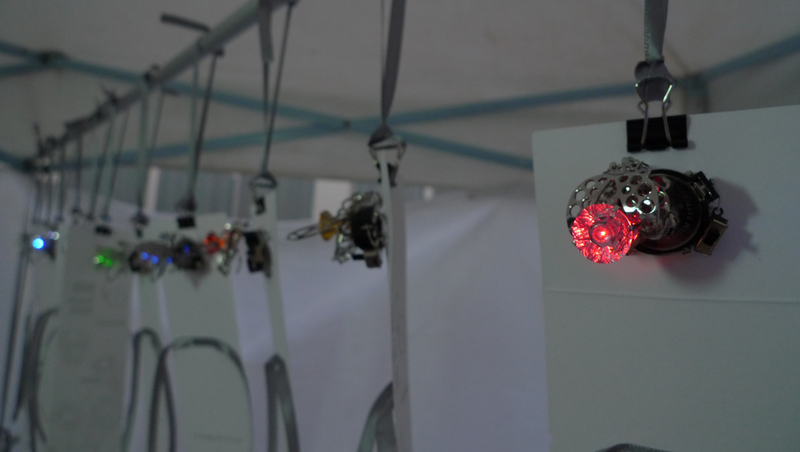 There were a lot of surprised and astonished faces, especially because of the use of the LED lights in the jewellery. 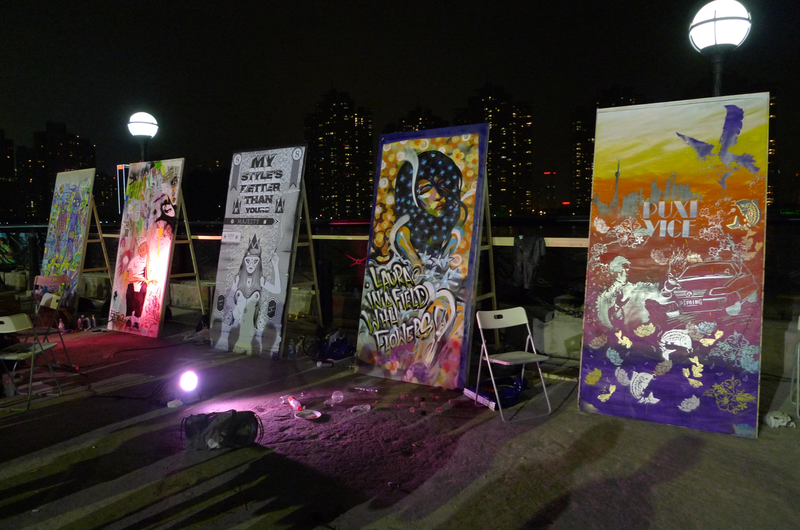 At some point in the evening, I heard of a street art competition with several graffiti artists taking part but again, I could not make it there. Rachel went to see it though and she was kind enough to give me her pictures, so you can see them now too. I met one of the graffiti artists, Siu Tang, later on. Have a look at his blog here. 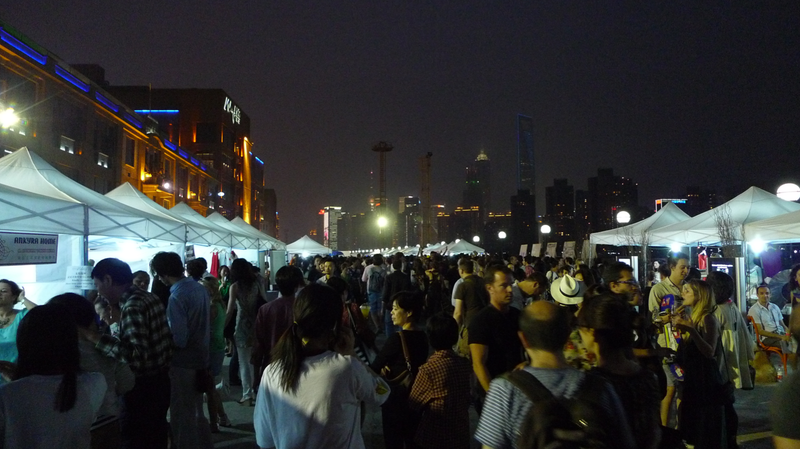 For some reason, the event was shut down by the police around 10pm. They just came in at some point and locked the main entrance gates. I am not sure why or what happened. It was a bit of a shame, since the fair was meant to last until midnight but I felt sort of relieved as well, because my feet were killing me from straight 12 hours standing. I did not even make it to the after-party at Strictly Designers United anymore. 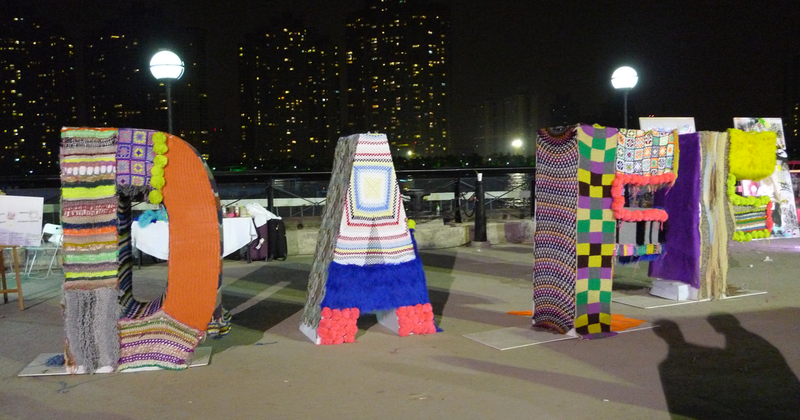 Instead, I fell asleep on the 15min cab journey home to wrap up the display! 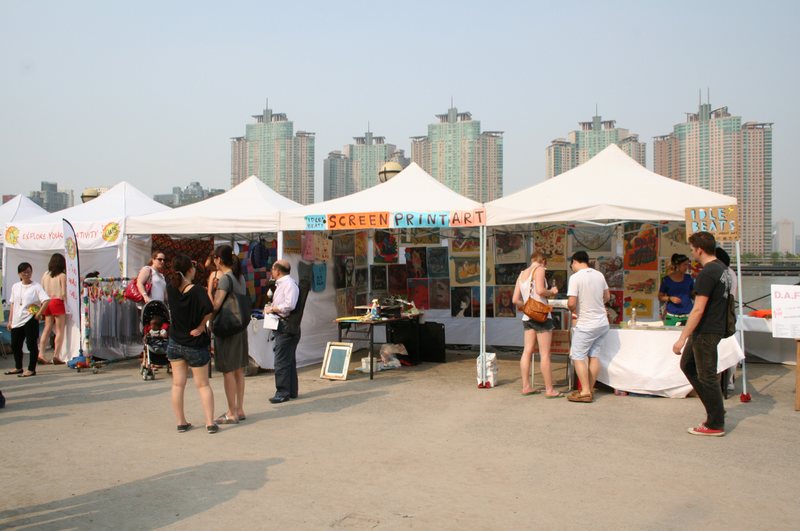 Here are a few more pics of the event, showing you the vibe of the day in 30 degree sunshine and hundreds of visitors. I really enjoyed taking part and I hope there will be a repetition soon! I am very much looking forward to it… I hope you too! Please follow this blog and visit www.proonk.com, www.lisa-juen.com. Thank you!